Joseph C. Stiles (Joseph Clay), 1795-1875 Capt. 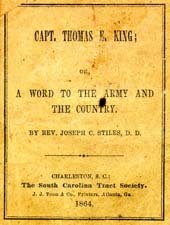 Thomas E. King, or, A Word to the Army and the Country. Capt. Thomas E. King, or, A Word to the Army and the Country. Charleston, S.C.: The South Carolina Tract Society, 1864 (Atlanta, Ga.: Franklin Printing House). Chickamauga (Ga.), Battle of, 1863. Confederate States of America. Army -- Officers -- Diaries. King, Thomas E., d. 1863 -- Diaries. Patriotism -- Confederate States of America.